This article is about operating systems that use the Linux kernel. For a list of such operating systems, see Linux distributions. For other uses, see Linux (disambiguation). Linux or GNU/Linux is a Unix-like operating system (or strictly family of) for computers. An operating system is a collection of the basic instructions that manage the electronic parts of the computer allowing running application programs. Linux is free software, meaning everyone has the freedom to use it, see how it works, change it, or share it. There is a lot of software for Linux and—like Linux itself—a lot of the software for Linux is free software. This is one reason why many people like to use Linux. The defining component of Linux is the Linux kernel, an operating system kernel that Linus Torvalds developed, first alone. Linux is typically packaged in a Linux distribution (or distro for short). Distributions also include supporting system software and libraries, many of which are provided by the GNU Project. Linux was originally developed for personal computers. Linux is the leading operating system on servers such as mainframe computers, and the only OS used on supercomputers (at least on the TOP500 list, since November 2017). It is used by around 2.3 percent of desktop computers. The Chromebook, which runs the Linux kernel-based Chrome OS, dominates the US K–12 education market and represents nearly 20 percent of sub-$300 notebook sales in the US. Linux also runs on embedded systems, which are devices whose operating system is typically built into the firmware and is highly tailored to the system; this includes mobile phones (especially smartphones), tablet computers, network routers, facility automation controls, televisions, digital video recorders, video game consoles and smartwatches. In fact, the Android operating system, a mobile operating system built on top of the Linux kernel, has the largest installed base of all general-purpose operating systems. In March 2017, it was reported that there were more users on Android than on Microsoft Windows, which is not based on Linux. In the 1980s, many people liked to use an operating system called Unix. But because it restricted the user from sharing and improving the system, some people made a new operating system that would work like Unix but which anybody could share or improve. MINIX, similar to Unix, was used as a teaching tool for university students to learn how operating systems worked. MINIX also restricted its sharing and improvement by its users. A group of people called the GNU Project wrote different parts of a new operating system called GNU, but it did not have all the parts an operating system needs to work. In 1991 Linus Torvalds began to work on a replacement for MINIX that would be free to use, and which would not cost anything. Linus started the project when he was attending the University of Helsinki. This eventually became the Linux kernel. Linus Torvalds shared the Linux kernel on some internet groups for MINIX users. Linus first called the operating system "Freax". The name Freax came from joining up the English words "free" and "freak", and adding an X to the name because Unix has an X in its name. Ari Lemmke, who worked with Linus at the University, was responsible for the servers that Freax was stored on. Ari did not think Freax was a good name, so he called the project "Linux" without asking Linus. Later, Linus agreed that Linux was a better name for his project. Linux relied on software code from MINIX at first. But, with code from the GNU system available for free, he decided it would be good for Linux if it could use that code, instead of code from MINIX, because MINIX did not let people share or change it how they wanted. The GNU General Public License is a software license that lets people change any part of the code they want to, as long as they share any changes they make with the people they give their software to and allow them to redistribute it for free or for a price . The software from GNU was all licensed under the GNU General Public License, so Linus and the other people who worked on Linux could use it too. To make the Linux kernel suitable for use with the code from the GNU Project, Linus Torvalds started a switch from his original license (which did not allow people to sell it) to the GNU GPL. Linux and GNU developers worked together to integrate GNU code with Linux to make a free operating system. Since 1991, thousands of programmers and companies have worked to make Linux better including Google. 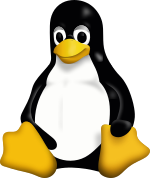 The mascot of Linux is a cartoon penguin named "Tux". When a person sees the penguin on software and hardware, it means that it will work with Linux, and sometimes all systems that are like Unix. The idea of the penguin came from the creator of Linux, Linus Torvalds. The image was made by a man named Larry Ewing in a competition to create a logo. The image, Tux, did not win, but it was picked as a mascot later. Tux has now become a symbol for Linux, and sometimes even for open source. He can be seen in many different places and often, when people refer to Linux, they think about Tux. Tux has even been included in many video games, such as Super Tux (like Super Mario Bros.), Tux Racer (where players race Tux down an icy hill) and Pingus (like Lemmings). Although there are only a few Linux versions for some Mac OS X and Microsoft Windows programs in areas like desktop publishing and professional audio and video there are programs that are comparatively similar in quality compared to those available for Mac and Windows. Many free software programs that are popular on Windows, such as Pidgin, Mozilla Firefox, LibreOffice, Chromium, VLC and GIMP, are available for Linux. A growing amount of proprietary desktop software can also be used under Linux, such as Adobe Flash Player, Spotify and Skype. CrossOver is a proprietary solution based on the open source Wine project that supports running Windows applications such as Microsoft Office and Adobe Photoshop under Linux. Linux has mainly been used as a server operating system, and has risen to be known by a lot of people in that area; Netcraft reported in February 2008 that five of the ten best internet hosting companies run Linux on their web servers. This is because of its stability and uptime, and the fact that desktop software with a graphical user interface for servers is often unneeded. Linux is commonly used as an operating system for supercomputers. As of November 2017, all of the top 500 supercomputers run Linux. Torvalds has made available an audio sample which indicates his own pronunciation, in English and Swedish. A 2001 study of Red Hat Linux 7.1 found this distribution had 30 million lines of code. The study showed that Red Hat 7.1 required about 8,000 years of time to develop. The study also said that if all this software had been made by proprietary means, it would have cost about $1.08 billion to make in the United States. As of 7 March 2011, Linux kernel would cost about $3bn. Version 3.10 of the Linux kernel, released in June 2013, has 15 million lines of code, while the version 4.1, released in June 2015, has grown to over 19.5 million lines of code by almost 14,000 programmers. Most of the code (around 71%) was written in the C programming language, and many other languages were used, including C++, assembly language, Perl, Python, Fortran, and various shell scripting languages. A little more than half of all lines of code were licensed under the GPL. People might pay some money for a version, so they can have a CD-ROM or DVD and to help the company to make their versions better. Usually when someone pays, it is so the company will help the user after they install it, which is called "support". The Kernel and the Shell. Apache allows users to run their own website. KDE and GNOME are desktop environments. LibreOffice is for office work. Mozilla Firefox is an Internet (Web) browser. GIMP, Inkscape and Blender help people work with pictures. Games such as Tux Racer. The Linux kernel and most GNU software are licensed under the GNU General Public License (GPL). The GPL requires that anyone who distributes the Linux kernel must make the source code (and any modifications) available to the recipient under the same terms. In 1997, Linus Torvalds said, “Making Linux GPL'd was definitely the best thing I ever did.” Other key components of a Linux system may use other licenses; many libraries use the GNU Lesser General Public License (LGPL), a type of the GPL that is less restricted, and the X Window System uses the MIT License. "Linux" is a trademark of Linus Torvalds. ↑ "Linux" trademark is owned by Linus Torvalds and administered by the Linux Mark Institute. ↑ "The Linux Kernel Archives: Frequently asked questions". kernel.org. September 2, 2014. Retrieved September 4, 2015. ↑ Eckert, Jason W. (2012). Linux+ Guide to Linux Certification (Third ed.). Boston, Massachusetts: Cengage Learning. p. 33. ISBN 978-1111541538. Retrieved April 14, 2013. The shared commonality of the kernel is what defines Linux; the differing OSS applications that can interact with the common kernel are what differentiate Linux distributions. ↑ Linus Benedict Torvalds (5 October 1991). "Free minix-like kernel sources for 386-AT". comp.os.minix. (Web link). Retrieved on September 30, 2011. ↑ "What Is Linux: An Overview of the Linux Operating System". Linux Foundation. April 3, 2009. Retrieved August 15, 2011. ↑ "Twenty Years of Linux according to Linus Torvalds". ZDNet. April 13, 2011. Archived from the original on September 19, 2016. Retrieved September 19, 2016. ↑ Linus Benedict Torvalds (October 5, 1991). "Free minix-like kernel sources for 386-AT". comp.os.minix. (Web link). Retrieved on September 30, 2011. ↑ "What Is Linux: An Overview of the Linux Operating System". Linux Foundation. April 3, 2009. Archived from the original on August 13, 2011. Retrieved August 15, 2011. ↑ DistroWatch. "DistroWatch.com: Put the fun back into computing. Use Linux, BSD". distrowatch.com. Archived from the original on April 2, 2013. Retrieved 2016-12-30. ↑ Bhartiya, Swapnil. "Best Linux distros of 2016: Something for everyone". CIO. Archived from the original on December 31, 2016. Retrieved December 30, 2016. ↑ "10 Top Most Popular Linux Distributions of 2016". www.tecmint.com. Archived from the original on December 30, 2016. Retrieved December 30, 2016. ↑ Computerworld, Patrick Thibodeau. "IBM's newest mainframe is all Linux". Retrieved February 22, 2009. ↑ Linux Devices (January 2010). "Trolltech rolls "complete" Linux smartphone stack". Archived from the original on 2012-05-25. Retrieved September 29, 2009. ↑ "Sony Open Source Code Distribution Service". Sony Electronics. Retrieved October 8, 2011. ↑ "Sharp Liquid Crystal Television Instruction Manual" (PDF). Sharp Electronics. p. 24. Retrieved October 8, 2011. ↑ IBM (October 2001). "Linux Watch (WatchPad)". Retrieved June 18, 2015. ↑ "NetMarketShare:Mobile/Tablet Operating System Market Share". ↑ Vaughan-Nichols, Steven J. (2017-04-03). "Sorry Windows, Android is now the most popular end-user operating system | ZDNet". ZDNet. Retrieved 2018-03-04. ↑ "What would you like to see most in minix?". comp.os.minix. (Web link). Retrieved on 2008-08-18. ↑ Torvalds, Linus (1992-01-05). "RELEASE NOTES FOR LINUX v0.12". Linux Kernel Archives. Retrieved 2007-07-23. The Linux copyright will change: I've had a couple of requests to make it compatible with the GNU copyleft, removing the “you may not distribute it for money” condition. I agree. I propose that the copyright be changed so that it confirms to GNU ─ pending approval of the persons who have helped write code. I assume this is going to be no problem for anybody: If you have grievances (“I wrote that code assuming the copyright would stay the same”) mail me. Otherwise The GNU copyleft takes effect as of the first of February. If you do not know the gist of the GNU copyright ─ read it. ↑ Advani, Prakash (2000-10-27). "Microsoft Office for Linux?". FreeOS. FreeOS Technologies (I) Pvt. Ltd. Retrieved 2008-08-18. ↑ Smith-Heisters, Ian (2005-10-11). "Editing audio in Linux". Ars Technica. Ars Technica, LLC. Retrieved 2008-08-18. ↑ Lumma, Carl (April 2007). "Linux: It's Not Just For Computer Geeks Anymore". Keyboard Magazine. New Bay Media, LLC. Retrieved 2008-02-03. ↑ James, Daniel (February 2004). "Using Linux For Recording & Mastering". Sound On Sound. SOS Publications Group. Retrieved 2008-02-03. ↑ "The table of equivalents/replacements/analogs of Windows software in Linux". ↑ "The Global Desktop Project, Building Technology and Communities". Retrieved 2008-08-18. ↑ "OPERATING SYSTEM FAMILY / LINUX". Top 500. Retrieved December 25, 2018. ↑ "Howto pronounce Linux?". Retrieved 2008-08-18. ↑ "Linus pronouncing Linux in English and Swedish". Retrieved 2008-08-18. ↑ Wheeler, David A (2002-07-29). "More Than a Gigabuck: Estimating GNU/Linux's Size". Retrieved 2008-08-18. ↑ Wheeler, David. "The Linux Kernel: It's Worth More!". ↑ "What's new in Linux 3.10". ↑ "Linux Kernel At 19.5 Million Lines Of Code, Continues Rising". ↑ "Linus Torvalds interview". Archived from the original on 2007-03-11. Retrieved 2008-08-18. This page was last changed on 27 February 2019, at 04:13.